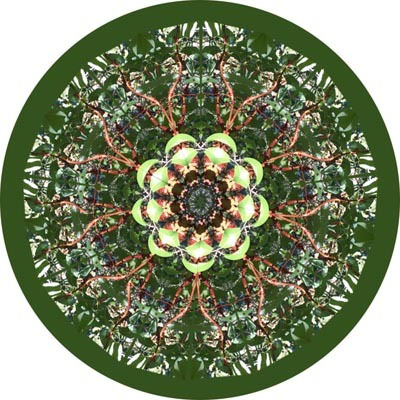 Mandalas are found everywhere and have powerful symbolism across all cultures. All circles have a center. This is principle of the center. 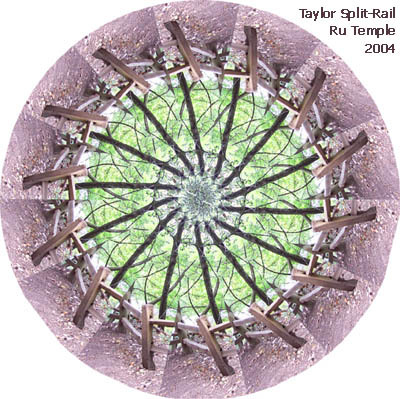 The center represents expansion and integration of opposites, micro and macrocosms. 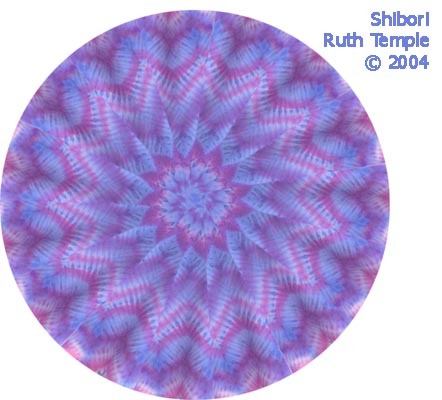 The center also represents the soul, god or the individual. 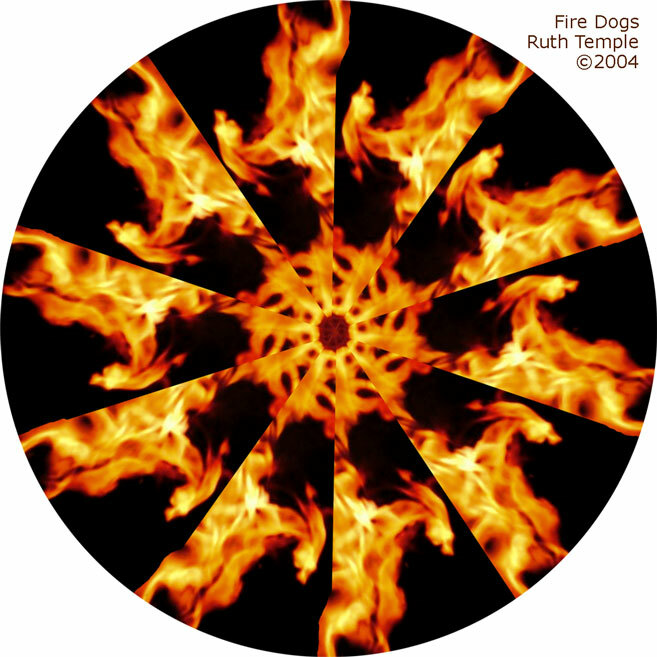 Circles symbolize unity/time/universal cycles/life creation/eternity/god/sun. 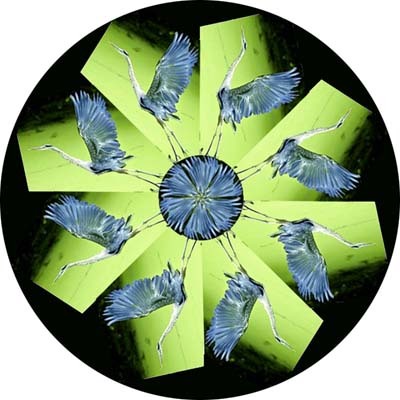 All of Nature's harmonious principles are exhibited through its harmonious relationships. 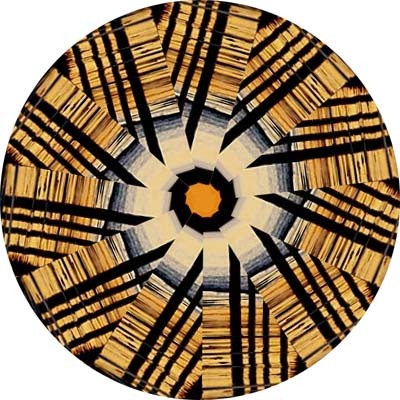 from Jose and Miriam Arguelles Mandala Shambala: Berkeley and London, (1972). A rotary plaid, almost, made from sun under a So. Cal. pier. 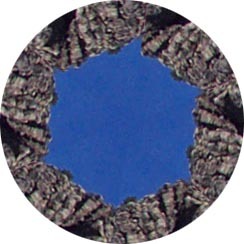 From a photo of a madrone tree inland from the Northern CA coast, August 2004. The lush olive-green of these leaves makes such a contrast to the dusty sage greens of the palo verde up Sabino Canyon in the next images. Sabino Canyon is in a park near where my folks winter over in Tucson, AZ. One yule we rode up and strolled down the little road up the hill there. 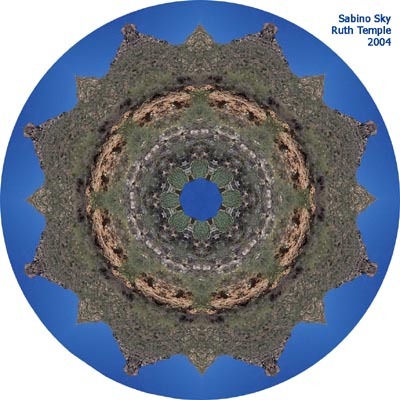 Another take from the same working mandala of the Sabino Canyon hill and rim of sky, showing detail a little closer in. 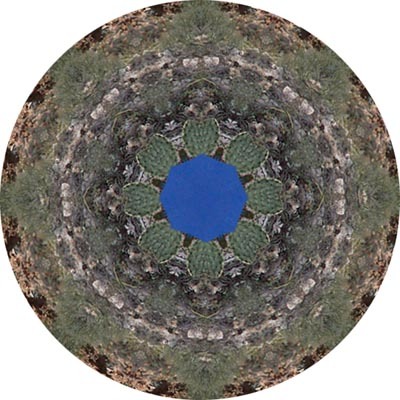 This little guy is to show the intermediate step, a clip of cliff and sky rotated sixfold to make the center of the other two mandalas from the same Sabino Canyon photo. The basic technique I use was learned from Elizabeth Badurina, where you copy a wedge-shaped piece out of a photo you adore, and drop it into PhotoShop; copy a few more times, and Edit Transform each layer of picture-wedge into place by rotating and snugging them up one against another. When you have a few rotated around and placed, merge those layers and copy and paste and manipulate larger wedges. While it's tempting to go for even 8s or 12s, it's also fascinating to see if you can make an odd number of wedges all fit together. 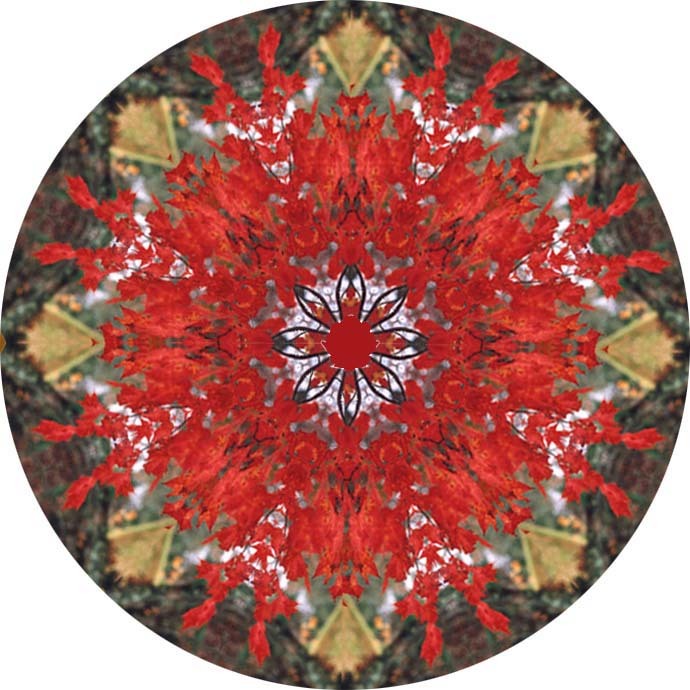 Here's a quick description of how and what I do in making a mandala, from 2004: I use PhotoShop on a Mac to do this; you you cut and paste a wedge-slice, and either double the image with a flipped copy (like the cars) or not (like the manzanita first one I did). Copy and paste your basic element (where it lands in a new layer), and select and Transform that (?-T) with a free-rotate tool; then it's up to your eye and brain to joggle 'em right so you get even iterations however-many around. 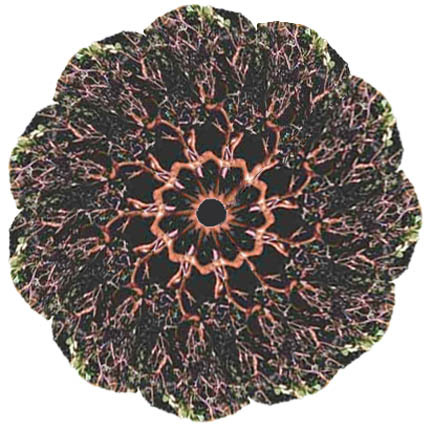 I freely confess to having a wiggly-enough brain to really enjoy things like the 11- fold radial symmetry of the manzanita mandala the best, but when my car-iterations were being Just Too Wierd to fit as originally sized, I joggled 3 iterations into a 90� wedge, and copied and spun that three times to make the 12-fold symmetry of the bookended image. Still with me? I used another photo of the other side of the car, flipped that to make the center, and used an 8-fold spin of foliage from that second photo to fill out the greenery behind the center motif; saved all this as a .psd file; saved a copy of all this to another file where I linked all the layers, selected a circular image, cut and pasted that to a new document, refined the size, flattened the image and saved to the jpg you see. Eliza's Mandala page and technique are here at moderngypsy.com. 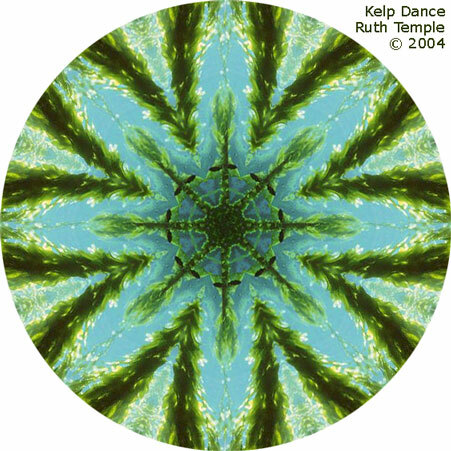 Earth Mandalas has a different technique, tutorial and template you can easily use in Photoshop, here. 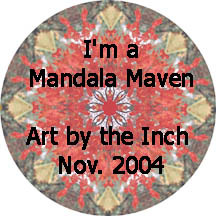 Powell's Books carries a number of good books on Mandalas and the making thereof. Support independent booksellers like Powells! All contents of this web page are created by and copyright to Ruth Temple �2004, and are licensed under a Creative Commons License. Anyone wishing to use any image from this page in any commercial setting is welcome to contact me for licensing information.